One drawback to owning lots of awesome electronics is finding enough outlets to plug everything in. With a desktop computer, you likely need extra outlets for a monitor, printer, desktop speakers, wireless router, mobile devices, and other gadgets. For a home theater system, there’s the television, stereo receiver/amplifier, preamp, subwoofer, speakers (sometimes), turntable, DVD/Blu-ray player, gaming consoles, and cable set-top box to consider. The solution? Get an outlet tap/splitter, which would typically be your everyday power surge protector or power strip. While both these options offer extra outlets, that’s where general similarities end. Most (but not all) surge protectors are also power strips, but power strips are not surge protectors. You’ll often see the two types displayed together on the same aisle of your local hardware or electronics retail store. But don’t just grab the first one that catches your eye! There are significant differences and benefits to consider. At a glance, surge protectors and power strips look like they do the same thing. But while power strips are basically multi-plug extension cords, surge protectors are designed to keep electronic equipment safe from – you guessed it – electrical surges (and spikes). Surge protectors work by diverting excess voltage into the grounding port of a wall outlet. Without this feature, the excess voltage would flow through all connected power cables and cause permanent damage to connected devices. The effect of excess voltage can be as obvious and instantaneous as a filament light bulb burning out with a pop. But it can also inflict harm discreetly over time, where the added burden of energy gradually weakens the integrity of electronic circuitry (think about your most expensive gear with complex microprocessors), resulting in terminal failure. An extreme example of excess voltage is a lightning strike. But those are rare (depending on where you live) and too powerful to be contained by a surge protector – it’s safest to unplug electronics during a thunderstorm. You’re more likely to experience electrical surges and spikes when the local utility company switches power grids and/or has equipment problems. Even though they try to maintain a steady flow of electricity throughout, disruptions happen. The most common instances of excess voltage occur when there’s a shift in energy demand, especially if the building has old or bad electrical wiring. Ever notice lights flickering or going dim whenever the refrigerator, air conditioner, hair dryer, or any other powerful appliance turns on? That sudden request for energy can cause a momentary surge to the demanding circuit and affect all connected outlets. In North America, anything above the standard voltage of 120 V is considered excess. Smaller surges can happen anytime without any signs yet still surpass a product’s normal operating voltage. 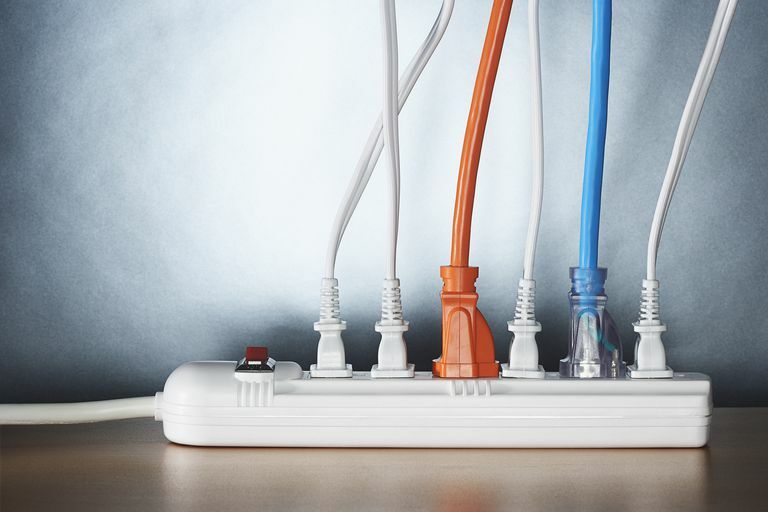 You won’t be doing yourself any favors by purchasing a six-outlet surge protector when you have 10 devices to plug in. The last thing you want to do is daisy chain another surge protector or power strip to make up the difference – that increases the risk of overloading the electrical circuit as well as voids the warranty of the surge protector(s). If you’re uncertain as to the exact number of outlets you need, always go for more since extras are useful. Not all surge protectors are designed with power bricks in mind. Some power bricks are so bulky that they can block a free outlet (or two or three) when plugged in. Even if your current equipment uses standard two-prong plugs, it’s worth choosing a surge protector that has some outlets spaced apart. You’ll still be able to use them all now, yet retain the flexibility to handle any power bricks in the future. A surge protector won’t do much good if it can’t reach the closest wall socket. Sure, you could use an extension cord, but doing so doesn’t guarantee full protection and often voids the product warranty. So when in doubt, choose surge protectors with the longest length power cable. Joules (higher is better): The number of joules listed for the surge protector represents the energy absorption rating. Think of it like a shield that blocks excess energy. Higher numbers mean the surge protector can sustain more (or bigger) hits through single or multiple events over time before wearing out. So if a surge protector has 500 joules of protection, it could theoretically handle ten 50-joule hits, or four 125-joule hits, or two 250-joule hits, or one 500-joule hit. Small electronics (e.g. lamps, radios, battery chargers, etc.) are fine with joule ratings under 1000. But for computer and/or home theater equipment, you’ll definitely want to consider surge protectors with joule ratings of 2500 or more. Clamping Voltage (lower is better): The clamping voltage – sometimes referred to as Voltage Protection Rating (VPR) or Suppressed Voltage Rating (SVR) – indicates when the surge protector will activate to divert excess voltage to ground. Think of it like parrying/redirecting. While the protection offered by joules sounds good, it’s the clamping voltage (maximum voltage to be allowed through) that ends up being far more effective. Lower numbers mean the surge protector is less tolerant of excess voltage. So when comparing a surge protector with 330 V clamping voltage (best option) versus one with 500 V clamping voltage, the latter will allow a higher surge/spike to occur (which can damage components) before doing anything about it. Response Time (lower is better): The response time (typically measured in nanoseconds) indicates how quickly a surge protector will react in order to divert excess voltage. While electronics seem to work instantly, they actually require time to operate. Response time goes hand-in-hand with the clamping voltage. Surge protectors with lower response times activate faster in order to redirect excess voltage before it has a chance to cause damage. If you want the best, choose ones with response times at one nanosecond (or less). UL 1449 (must have): The Underwriters Laboratories UL 1449 is the recognized safety standard that applies to every Surge Protective Device (SPD). This standard lists the certification criteria, design requirements, and product performance testing that manufacturers need to meet in order for a surge protector to be considered safe for consumer use. If a surge protector doesn’t have this displayed somewhere on the box, it may not be the best choice for protecting your equipment. As with most types of consumer electronics, surge protectors come with a manufacturer’s warranty that also covers connected equipment up to a specified maximum dollar amount (varies from product to product). Hopefully, you’ll never have to use it, but it’s always best to be prepared. Make sure you thoroughly read the fine print regarding the warranty coverage. Some claims require the surge protector, all the equipment (whether or not each suffered any damage) connected to the surge protector at the time of damage, and original receipts for everything. There’s usually a lot of exclusions, conditions, and limitations (i.e. flaming hoops to leap through) that need to be met before you’d ever see a dime, and full reimbursements are never guaranteed. You can also expect claims to take three or more months to process. It’s critical to plug a surge protector into a properly grounded wall outlet – using a three-to-two prong adapter does not count. Otherwise, it won’t be able to protect like it’s meant to. Joules aren’t everything. Be sure to equally consider both the clamping voltage and response time. Don’t daisy chain surge protectors with other surge protectors, and/or power strips, and/or UPSes for more outlets. You run the risk of overloading the house’s electrical circuits, igniting an electrical fire, and/or voiding the surge protector’s warranty.